A thrombus is a clot developed from intravascular coagulation in the bloodstream. When the endothelium is damaged, platelets can adhere to the subendothelial structures. The now active platelets adhere to each other ("aggregation") and release various activators of the coagulation system which induce the formation of a fibrin mesh around the platelet aggregate. Due to the light color of the platelets, the separation thrombus is also called "white thrombus". The slowdown or stasis of the blood flow activates the coagulation system. In the affected area, sometimes a whole blood column coagulates. The thrombus has no connection to the vascular wall, and therefore, its cell composition and color correspond to those of normal blood. It is also called "red thrombus". 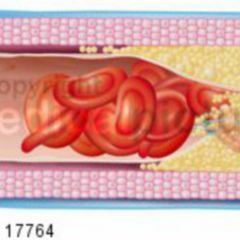 The formation of a separation thrombus causes a blood flow disruption and the formation of a secondary agglutinative thrombus. Morphologically, you can distinguish a light "head" (white thrombus) and a dark "tail" (red thrombus). 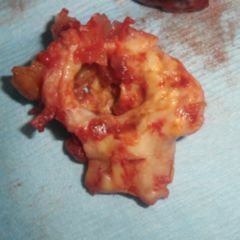 A thrombus basically can be degraded again by the fibrinolysis system. 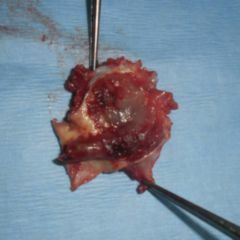 The completeness of this process depends on the age and size of the thrombus. Therapeutically, this process can be pushed by a medicinal thrombolysis. If the thrombus remains in the vessel, it can stay clinically unsuspicious, or it can impair the blood flow - or stop it completely. This is associated with the corresponding damages of the affected organs. 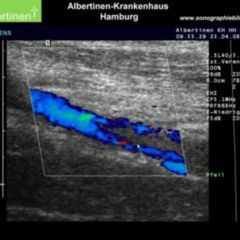 However, parts of the thrombus can detach and be taken along into narrower sections of the vessel where they cause an occlusion by the bloodstream. Dependent on the localization of the occlusion, the resulting consequence is eg. myocardial infarction, pulmonary embolism, or apoplexy.